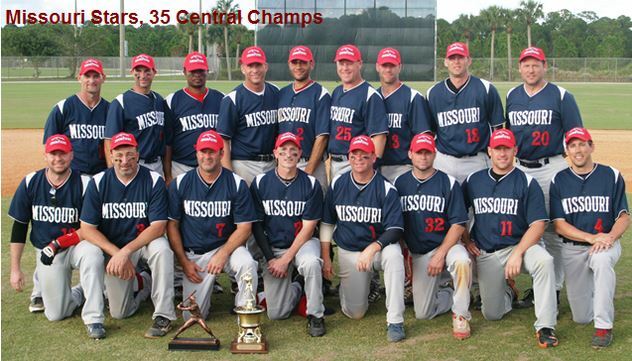 Jupiter, Fla. — Pat Judge induced 18 ground ball outs over nine innings as the Missouri Stars defeated a stubborn Mifflinburg Phillies 5-3 to win the 35-and-over Central Division championship Jupiter, Florida. After securing a comfortable 5-0 lead through six innings, Missouri committed two errors in the seventh inning and opened the door to a two-run Mifflinburg rally. The Phillies added another run in the ninth inning, but two infield grounders ended their hopes of a comeback. It was an appropriate ending for the Phillies who pounded Stars’ pitcher Pat Judge’s pitches into the ground for 18 ground ball outs on the day. Judge, who earned MVP honors, constantly changed speeds, scattering just seven hits and surrendering only three walks. Combined with timely hitting and aggressive base running, the championship game was one of the few times throughout the tournament when all of the stars aligned for Missouri. “We got a slow start hitting this week,” Judge said. Though Missouri finished pool play with a 4-1 record, the team was barely hitting .300 going into the playoffs and looked downright anemic in a 14-5 loss to the Delaware Destroyers. That all changed the following day when they pounded out a 14-5 win against the St. Louis Chiefs. The Stars’ offense cranked it up again in the second playoff round destroying the Destroyers 22-4 in a rematch. The Stars entered the finals with hot bats and fresh arms. The Phillies entered the playoffs with a 4-1 record where they outscored opponents 58-11. They defeated the Raleigh Red Sox 7-2 in the quarterfinals, and then beat the Carolina Indians 7-5 in the semifinals. Mifflinburg’s starters, meanwhile, had plenty of work going into the finals. Ace Pete Hayden, making his first Fall Classic appearance, threw 19 innings. He pitched in the first game against Venezuela, in the opening playoff game against Raleigh, and he earned the save in the semifinal game against a tough Carolina Indians team. “I don’t know how he did it physically but he did it,” said Mark LeValley, the Mifflinburg manager. LeValley started the finals for the Phillies but exited in the fourth inning. Hayden threw two solid innings and Steve Russell finished out the eighth. The Stars notched 15 hits total and had amassed a 5-0 lead after five full innings. Hennage, who went 1-for-3, stole a base and scored a run in the championship game, was one of several Missouri players to come from the St. Louis Longhorns, which won the city’s 35+ league this year. Judge, outfielder Barry Grant (3-for-3) and catcher Myke Jacobs also play for the Longhorns. Several players joined the Missouri team from the St. Louis Twins, as well, including shortstop Brad Stephens (2-for-4), Steve Flowers (2-for-4) and Mark Burris (2-for-4). Joel Sigman, a pitcher/infielder from the St. Louis Sharks, also played a key role for the Stars, earning two wins on the mound and going 3-for-3 in the championship game. The Phillies’ German Evangelista and Marty Rosenberry collected four of Mifflinburg’s seven hits against Missouri, and Matthew Diltz hit well all week. Editor’s Note — because of rains, the game was moved from ‘Roger Dean Stadium to the Marlins complex.